As to the gear listed above, it’s necessary, of course, to be prepared and informed of the shooting conditions, especially the kind and behaviour of wildlife and the distance to the subjects that is expected at the location before you leave for a trip. For example, the bulky 600mm lens is not needed in Antarctica or on Galapagos where wildlife is sitting right in front of you most of the time. So you have to define your needs in advance of each trip, the more as the restrictions for carry-on luggage are reported to get more and more rigid, – especially on some airports in Western Europe. Though there’s no logical connection of weight, dimensions and security after the events of 9/11 and more recent terroristic attacks, politicians and several airlines don’t care about the necessity to protect the fragile equipment from damage. They don’t see themselves responsible if the gear is lost, stolen, broken or at least misaligned if you have to put it into the checked luggage with a high risk of being dropped or thrown around. But though I met some photographers who had faced a lot of trouble at big airports like London Heathrow and Frankfurt, I personally have been lucky so far and had no serious problems to take my gear into the cabin. Since I often can split the equipment with my wife, I have been able to bring most of the gear I planned for my trips. I always try to chose a good airline and to avoid the airports known for trouble. Nevertheless, travelling by air is more and more getting a challenge for serious photographers and I’ m pretty nervous every time now as long as I’m not sitting in the plane. Over time the gear has grown considerably with some evident redundancy, too. 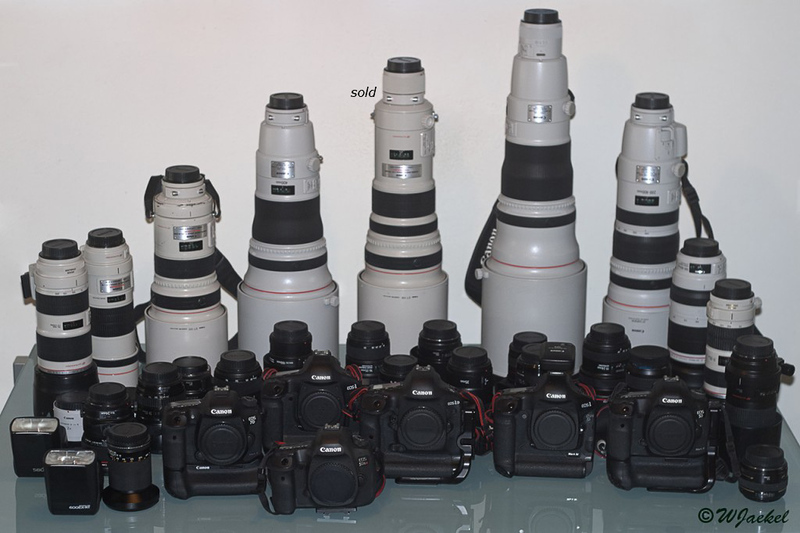 Of late, the prices for used equipment tend to drop significantly in a short time but I don’t need to sell the costly cameras or lenses dirt-cheap. So I feel no pressure to dump it rapidly. Nevertheless, in the long run I will have to streamline the gear a bit face to the restrictions mentioned above. For example, I had not used the 500mm /f 4.0 IS very often after I got the 200-400 + ext and especially the 600mm /f 4.0 II IS USM two years ago which is about the same weight but doesn’t fit in each of my bags, though. Nevertheless, the 500mm recently was sold.The first generation 16-35mm/f 2.8 L rarely is on my pack list anymore since I have the 16-35mm /f 4.0 IS. The same is true for the 300mm/f 4.0 IS unless I have to skip the 300mm /f2.8 IS for a more compact package. For photographing landscapes I usually take my 24-70mm, 70-200mm, the 16-35mm /f4 or 11-24mm/f4 lenses and as of late the 35mm II on my 5d3/5dsR cameras. For handheld street photography I sometimes prefer the 24-105 IS over the 24-70. I have kept my 1Ds MK III up to now, because the image quality with regard to colors @ ISO 100/200 and its “3D”- appearance still are superior over the 5d3 in my opinion. At higher ISOs and with regard to features and handling, there’s no competition though and the 5d3 wins hands down. Since I now have the 5dsR, too, which provides incredible details, I might consider to sell the 1Ds III provided I can achieve a fair price for it. In winter, Northern Lights have become one of my favourite motifs in the past years. I have been on several trips in Northern Norway and Iceland to chase the aurora borealis. Therefore the Nikon 14-24mm/f2.8 mounted on my 1Dx via the special Novoflex adapter has been my primary set up because this lens provides excellent optical quality when shooting wide open. In my view it’s even better here than the Zeiss 21mm/f 2.8 that has much stronger vignetting and is less flexible, of course. The Canon 16-35mm/f2.8 is no competition wide open and the 16-35mm/f 4.0 or 11-14mm/ f4.0 mostly is too slow for photographing the aurora. I recently bought the Sigma 20mm/1.4 which has been used for capturing additional time lapse videos on my 5d3 so far. The Sigma is pretty sharp when shot at wide apertures, though some coma is visible at closer examination. Moreover, it lacks the weather sealing and the flexibility of the Nikon zoom, of course. Previously I also owned the Canon 14mm/f2.8 II which was very good for shooting the aurora, too. But this lens was traded in for the purchase of the Canon 11-24mm. Finally, as to the Canon 35mm/f1.4, its angle of view mostly is too narrow for capturing the whole aurora display though the optics is perfect. For shooting wildlife, I mostly have used the 7d II/ 100- 400 II combo and 1Dx/200-400+Ext on my recent trips. 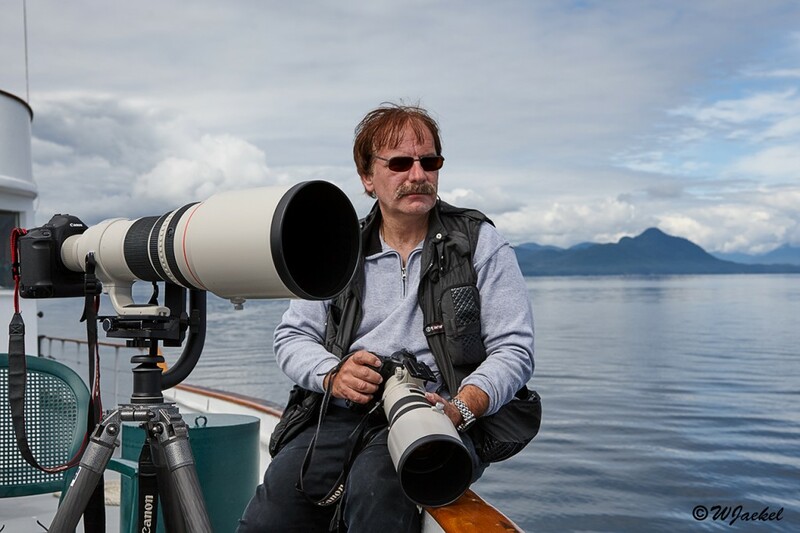 The first set up is excellent for handheld shots of fast moving wildlife or BIF due to the fast frame rate, its relatively light weight and the sophisticated AF, while the 1Dx has the priority in low light because of the better high ISO capabilities. That said, the 1Dx/ 200-400 combo is pretty heavy for longer hikes and extensive handheld shootings. If possible I prefer a monopod or even tripod here. I also have used the 1D Mark IV quite often for wildlife shots which has a typical 1-series robustness and a very slight advantage over the 7d2 at ISOs 1000 to 1600 Nevertheless, the 7d2 recently has been packed a bit more often into the bag .Of course, I always bring the 70-200mm on my wildlife trips and I add the 300mm/f.2.8 to my equipment on most trips whenever there’s still room in the bag or it has priority over one of the zooms.. The 600mm II is first choice if slow moving and/or more distant wildlife motifs are expected and the circumstances allow the use of the tripod/Wimberly. Regarding my workflow, I exclusively shoot in raw mode, the files are transferred from my Lexar- and Sandisk CF/SD cards to an external HD and to the Colorspace UDMA 2 Hyperdrive as a second back up. Whenever possible I organize and keyword my files while I’m on a trip without extensive evaluation at this point, though. Up to now I have used Lightroom for creating preliminary collections. Later at home, the files are downloaded from the external drives to my PC and more closely reviewed. The final selections are converted to 16bit tiff files into the ProphotoRGB colorspace through Capture One Pro. Canon’s DPP produces very good results, too, but the work with large numbers of files still leaves a lot to be desired regarding speed and handling though it has been improved in the recent 4.x version I have used DxO and Lightroom itself for post processing, too. Every Raw converter has its strengths and weaknesses but for me all comes down to the quality of the raw conversion. In my view C1 still has the best raw processing engine as for detail and color rendition. That said, the previous versions of Capture One pro up to v 8 still were inferior to LR for organizing and keywording the files. This has changed in v9.x so that I maybe will simplify my workflow in the future and completely switch to C1 for organizing my files, too. This actually could be anticipated by the fact the Adobe terminated the perpetual licensing in favor to the CC model some time ago and future cameras will not be suported in LR and AdobeRaw anymore unless you jump on the rental bandwagon that leaves you trapped for the future. After the conversion to 16 bit Tiff files some additional steps, such as the application of luminance masks, final tonal adaptations as well as optional noise reduction and sharpening still are done in Photshop CS 6 through adjustment layers. For the removal of vignetting, lens distortion and chromatic aberrations, I prefer PTlens Plugin, for Noise Reduction I use Neat Image pro and Luminance masks are applied via Lumenzia. If needed, some tonal refinements are done with NIK Color Effex Pro, for Capture Sharpening I use Pixelgenius Photokit Sharpener. Many of those steps could be performed in the raw converter prior to the conversion, too. So its a matter of preference but I’m used to apply the adjustments in PS so far. Anyway, the final 16 bit Tiffs are saved as masterfiles for further needs. They are back upped on multiple external HDs and additionally on my Raid 6 system. I do the same with the original raw files. For my work I use an Eizo CG 24 monitor which is calibrated and profiled with EyeOne (Xrite) Photo. Depending on the needs, the masterfiles are resized, converted into another colorspace and finally output sharpened at a later time. I do not constantly need a high number of prints and therefore didn’t buy one of the well- respected A3+ Epson printers in the past. There are many reports of clogging problems if the printer is not used daily or at least once a week. That’s why I still own the HP B 9180 pro printer which doesn’t suffer from those problems because of its daily self-cleaning mechanism. The quality of the prints has been very good in the past.. However, over time I faced several problems regarding service stall errors etc. Since the printer is not manufactured anymore and HP generally went out of business for desktop printers there’s no support anymore. Furthermore, the ink consumption is considerable due to the daily cleaning mechanism even if I don’t print. So in the end, the overall costs for printing presently don’t make up for the costs of sending my files to a well respected print lab if I plan an exhibition. That may change in the future again but I have not yet come to a final decision concering the purchase of another printer. My digital HDAV presentations are composed with the professional Wings Platinum Software which is produced by the Austrian Company AV Stumpfl and offers all kind of advanced options. So far I have used the Canon XEED SX50 digital projector for visualizing which provides SXGA+ resolution (1400 x 1024) and has a very good color rendition still surpassing the common home beamers by a considerable margin.Though its resolution has been compelling and adequate in the past, there have been advances in this regard and the prices of good projectors have come down. Therefore I consider buying a new one in the future which offers at least Full HD. There are still thousands of slides in my archiv, too, which need to be checked and optionally digitalized. For scans I use the Nikon LS 4000 filmscanner and Silverfast Scan Software which is programmed and distributed by Lasersoft. A final word regarding the workflow: In my understanding nature photography still is kind of a document as it was more or less in the film days. So I generally do rot arrange, combine or fake any of my motifs. This may be naiv in today’s digital world but that’s my position. I know that there are different opinions even of fulltime pros. But I’m not under pressure to sell my photos nor eager to win any competition. Either my photographs are good for my taste and serve my needs or they do not. I only correct technical defects such as vignetting, sensor dust and CA and adapt exposure or contrast which is necessary when shooting raws. The camera processor does exactly the same if jpegs are required out of the box. It comes down to the possibility to chose different kinds of films in the predigital world or to use a polarizer to remove flare and enhance saturation. At a certain point this can be regarded as manipulation too, of course. Therefore I know that there are questionable operations in the normal workflow too. But I’ve defined my personal limits as described above.